Enjoy some of the best virtual reality experiences right from the screen of your smartphone with our top picks of the latest apps. 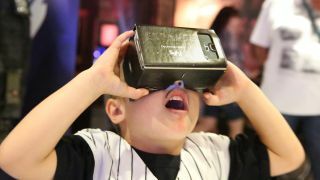 Virtual reality is one of the latest technology crazes that people are dying to experience. From roller coaster rides to zombie apocalypses, you can experience the most surreal environments right in front of your very eyes whilst sitting on your living room couch. But you don’t have to spend a fortune on fancy VR headsets in order to enjoy these amazing visuals. In fact, your smartphone is your very own gateway to another dimension simply by downloading the VR app of your choice from the app store. There are plenty of apps around these days, and although you do still need a headset, you don’t have to splash out on anything too fancy. You can quite easily get a VR headset for under £100, and Google have even created a cardboard headset which will only set you back £5.99…bargain! Plus, many of the virtual reality apps available are free, and pretty decent, so if you’re unsure if you’ll be a fan of VR, there really isn’t much to lose in trying it. They’re not all scary, and some are more interactive than others, so you really have quite a few options when picking the VR app for you. Some are story based while others are purely for entertainment; watch your favourite music videos or documentaries as if you were right there living it, or admire beautiful art and landscapes as if it were directly in your sights. VR has revolutionised our gaming experience, and you can now even browse social media via 360 degree video. We’ve picked out some of the best VR apps on the market right now, so get your headset on and enjoy the ride. The Google Cardboard app is designed to be used with the Google Cardboard VR headset, and in doing so you can experience some amazing sights. Explore exciting environments and even look at 3D objects within a museum collection. There are different journey options to choose from including Urban Hike which allows you to walk through some of your favourite cities in the world, Artic Journey which will allow you to fly over the arctic and see the Northern Lights right from the comfort of your own home. They also have a kaleidoscope option which will give you a fully immersive look at the classic colours and shapes we know and love. This is a great VR app to start out with and learn how to setup your Google headset. Buy now from iTunes or Google play. If you’re a big YouTube follower, then this VR app will rock your world. You can turn YouTube into a 3D 360 degree viewing platform for all your favourite channels. You’ll be able to log into your account and watch anything you like, and the audio and visuals are adapted to where you choose to look. You’ll need to enable your microphone for this one, as you will then be able to control what you watch via voice control so you can simply sit back and enjoy the entertainment. Users are a bit miffed that it isn’t available on iPhone, but on Android this app works really well. Choose from a catalogue of fascinating stories on Within, which allows you to fully immerse yourself in it's tales. From thrillers to feel-good adventures, you’ll be taken on a journey into Virtual Reality that’ll leave you wanting so much more. Some users said the download takes a little while, but once you’re in, you’ll not be able to put it down. It is also recommended to use high-quality headphones and sit back in your swivel chair so you can really enjoy the visuals. Download for Android or iOS today. NYT allows you to view new stories and become a part of the action via this VR app. You’ll be able to view a number of award-winning virtual reality films by New York Times journalists, and put yourself into their shoes in locations you’d never normally go. This app is compatible with Google Cardboard and it also has special audio to really heighten the effect of being right there in the action. You’ll get notifications when new content is released, so you’ll always be on top of the latest VR experiences, but you’ll need to have some patience when streaming as it has a tendency to buffer a lot. Download for Android or iOS today. If you want a VR app that allows you to really get in on the action, then this first-person shooter arcade game will provide hours of endless entertainment. It is compatible with Google Cardboard or your VR headset and you’ll be able to fly through space, attacking your enemies using either the headset’s trigger button or via stare-based shooting. You can hook up a gamepad to this app via Bluetooth if you have one, so you can also use the controls on this, and you can also disable the VR if you just want to play it as a regular game. Unfortunately it's only currently available on iOS, but the graphics are brilliant and users find this one of the best games to play with Google Cardboard. For a fast-paced game that will get pulses racing, Zombie Shooter will certainly keep you on your toes. Pick a weapon and off you go into the wasteland of the apocalypse, fighting zombies and other mutant creatures. It’s a fully immersive 360 degree experience, so you’ll have to keep your eyes peeled and watch your back. All you have to do to shoot is look at your target, but this can be trickier than it sounds when you’re on edge. Not one for the jumpy! Get it from Google Play or iTunes today. If you’re a big fan of art and wish you could travel the world to some of the best museums, now you can do so in the comfort of your own home, for free! This app takes you to over 1,200 international museums and galleries from around 70 different countries. You’ll be able to take virtual tours, zoom in on your favourite exhibits and learn more about particular artwork. The app gives you daily facts and will keep you posted don cultural events near you. You can also save your favourite pieces of artwork in your own personal gallery. The app could do with a few bug fixes, but overall it’s a lovely app that is both educational and entertaining. You can get this VR app from both Google Play and iTunes. This action/racing game is a great introduction to VR and is easy to set up with Google Cardboard or any other VR headset. The game is based on strategy and science so there are plenty of challenges but users say this game is generally easy to play. Some did say they found this game to cause a bit of nausea in some places, so if you get motion sickness this game might be a bit too much. However, this game can also be played when VR mode is switched off, so if you need a break you can. Get inCell on Android and iOS today. Thrill seekers can expect a fun experience with this VR Roller Coaster App. You can feel the real life sensation of a roller coaster with this 3D ride that is compatible with most VR headsets. Simply tap to start the ride and away you go. This game is a little short, and there are only a few rides to play on, but users say the graphics and sound effects are brilliant and it’s totally worth the ride. The app generates a new location and environment every time you open it for a unique experience. Download for iOS and Android today. The Discover VR app allows you to explore a whole host of different locations across the world, and watch 360 degree exclusive content from shows such as Shark Week, Deadliest Catch and MythBusters. You’ll get to experience things you would normally see in a documentary right in front of your very eyes, including precious species such as rhinos, elephants and tigers. If you leave a video halfway through the app will save it so you can continue watching, but be sure to make sure you have a strong internet connection (preferably Wi-Fi) when streaming content so you don’t interrupt your experience with buffering. You can choose to stream or download so that you can then watch the videos wherever you go. Get discovery for Android and iOS now.